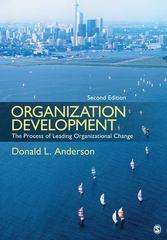 Organization Development 2 Edition Covering classic and contemporary organization development (OD) techniques, this is a comprehensive text on individual, team, and organizational change. Incorporating OD ethics and values into each chapter, Donald L. Anderson provides discussion of the real-world application of these theoretical ideas. In-depth case studies that follow major content chapters allow students to immediately apply what they have learned. In today's challenging environment of increased globalization, rapidly changing technologies, economic pressures, and expectations in the contemporary workforce, this book is an essential tool.